How long do you think it would take you to drive 10,000 miles? Quite a long time, eh? Well, a pair of British drivers just set a new record by doing it in just 10 days. The marathon trip was from London to Cape Town in South Africa and the bold drivers were Stephen Cooper and Robert Belcher. The exact time they took to get there was 10 days, 3 hours and 16 minutes. This was an improvement of more than 10 hours on the previous record. 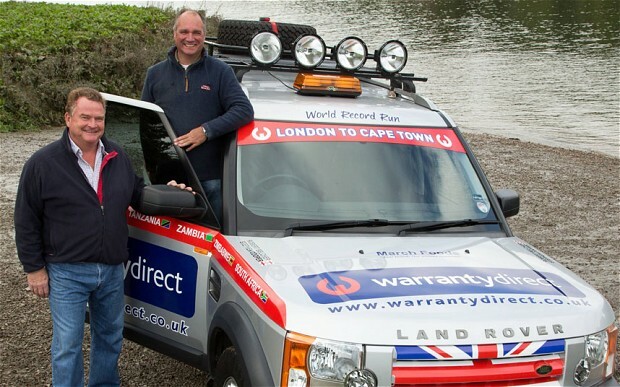 They set the new record driving a 2005 Land Rover Discovery with a 2.7 litre diesel engine. They set out from the RAC Club on Pall Mall on the 4th of October and came across all sorts of problem on the way. From encountering difficult weather conditions to running out of fuel and coming across giant potholes, they had a fairly interesting time of it. Apart from the start and end countries of the UK and South Africa they also drove through France, Italy, Tunisia, Libya, Egypt, Sudan, Ethiopia, Kenya, Tanzania, Zambia and Botswana. Throughout the trip they drove the vehicle virtually 24 hours each day. The addition of extra fuel tanks meant that they could go about 1,200 miles without stopping for refuelling. The pair got off to a flying start in Europe, spending only 27 hours on the continent. This meant that they went through over 1,700 miles (17% of the overall distance) in a little more than 10% of their allocated time. Robert Belcher said that they were “exhausted” at the end of the trip but that they were “absolutely elated”. He pointed out that they saw a lot of “friendly faces” along the way and that they often drove for hours without seeing any other vehicles on the road.